Eileen Karmy-Bolton is a third-year PhD student in Music at the University of Glasgow, researching the working lives of unionised musicians in early twentieth-century Valparaiso, Chile. In this month’s feature, she offers an account of her work in personal archives in Italy, and the benefits such work can offer for music research. Very few times archival trips are enjoyable experiences shared with someone who also enjoys digging in old documents, seeking answers about the same people. My last archival trip was like this, with the particularity that who I shared it with was also the host and one descendant of the musician I was researching. It all started with a mistake that now I can only see as a fortunate coincidence. This is how it happened. Figure 1 This is the beautiful main square in Manziana, the town where I conducted this unique archival visit. 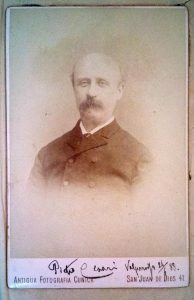 Some time ago, I wrote a short biography about Italian maestro Pietro Cesari (1836-1902), one of the key musicians I am researching for my PhD about music and labour in late nineteenth- and early twentieth-century Chile. As Cesari is mostly known for his role as orchestral conductor and composer, I wanted to highlight his contribution to musicians’ working lives, as one of the founders and first president of the Musicians’ Mutual Aid Society of Valparaíso, which is the main case study of my research. I published a short post − in Spanish − on my website http://memoriamusicalvalpo.cl/, where I share some of the findings and documents related to the research. The post included some photos of Cesari that I had found online after finding only one photo of him in books and archives. After the post had been online a certain time, I got an email saying that one of the men in the photos was not “this Pietro Cesari, but the other one”. There were two different but contemporary Pietro Cesaris! Both were Italian musicians, one was a composer and orchestral conductor, and the other a baritone opera singer. Both travelled to perform in South America in the late nineteenth century; however, only one of them stayed in Valparaíso and developed a key role there. I learnt this afterwards. However, I don’t regret posting Cesari’s short biography with this mistaken photo. On the one hand, an ongoing online project can always be updated (which I did after learning this), and on the other, the consequences of this mistake were unexpectedly fruitful. The email was from Pia Settimi, who introduced herself as the great-granddaughter of the Pietro Cesari that I was interested in, the composer and orchestral conductor. This email was totally unexpected, and I could hardly believe that I was now in contact with a descendant of one of the key musicians of my thesis. This initial email led to an exchange of questions and partial answers in both directions. In one of her emails, she told me that in her house in Manziana (Italy) she had a scrapbook made by Cesari himself, along with other documents that might be useful for my research. She invited me to look at these documents and sent me a couple of scanned pages as a sample. I decided to go there. But it took more than six months until I could visit her and develop this archival research, a trip that was possible with the support of the Society for Latin American Studies Postgraduate Travel Grant. Figure 2 Pietro Cesari’s scrapbook, preserved by his great granddaughter, Pia Settimi. In this trip, I could see, touch and digitise Cesari’s scrapbook and other documents, such as letters, scores, and photography. 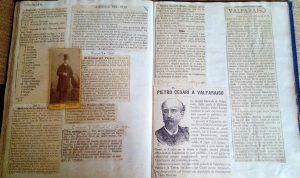 The scrapbook was made of clippings about Pietro Cesari’s musical life, both in Italy and abroad, including also his time in Valparaíso. Among the documents, which were vital in gaining a better understanding of his career and his contribution to musicians’ working lives, there were also some letters that he wrote to his family while he was in Chile. However, in addition to the archival visit, I also visited one of Cesari’s descendants. This opportunity was key, not only because she helped me a great deal with the research, but because she also wanted to learn about her ancestors. She helped me to digitise and translate most of the documents. We spent almost a week digging in all sort of papers. 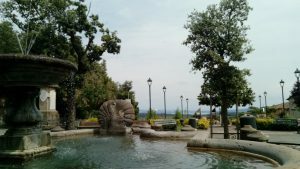 As such, we both gained fresh insights of the Cesari family, both to her questions about her ancestors and mine about the musical life of Pietro Cesari. Despite the differences of age, nationality and language, laughter and the complicity that a shared musical taste can bring broke all these barriers. When I arrived, I spotted a vinyl of the Chilean band Inti-Illimani at the entrance of her house. She had put it there on purpose. I was glad to see it, and when she saw me smiling, she promised to show me her other records. One of those days, when we were halfway in our digitisation task, she opened a box with all the vinyl albums recorded in Italy by Inti-Illimani, during their exile in the 1970s and 1980s. For anyone who is aware of the recent history of Chile, this simple fact means a lot. Since then, we not only shared our interest in the trace that Cesari left in Chile, but also in the mark that Inti-Illimani left in Italy, listening to songs such as “Venceremos” and “Cueca de la CUT”. After the time we spent together delving into all these documents, we made a timeline of Cesari’s musical work for my research, and a family tree of the Cesari family, for hers. We also laughed about this fortunate coincidence that started with a mistake. How many times, as researchers, we are afraid of being wrong and feel ashamed when we make a mistake? Perhaps I was wrong in publishing that post online without being entirely sure about who appeared in the photos. It was a mistake, yet fortunate. If Pia had not found the mistakenly attributed photo of her great-grandfather on my website, she would not have emailed me, and therefore, this trip would not have happened. 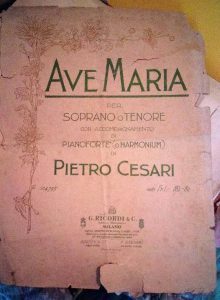 Figure 3 – One of Pietro Cesari’s scores stored in the family archive in Manziana. Figure 4 – Portrait of Pietro Cesari, photographed in Valparaiso on 24 June 1888, preserved in the family archive in Manziana. This archival trip was vital to my research and a valuable experience as a researcher. It was a unique mixture of archival research with a sort of in-depth conversation with one of Cesari’s descendant. After digging into Cesari’s family archive with the invaluable help of his great-granddaughter, I was able to fill important gaps in my thesis, outline a more comprehensive profile of Cesari’s career and gain a better understanding of his legacy in Chile. And if all this was a consequence of a simple mistake, I feel glad to have been mistaken because it resulted in the possibility of accessing unique documents and an exceptional research experience. It was established in 5 December 1893 under the name Sociedad Musical de Socorros Mutuos de Valparaíso. It gathered musicians based in the province of Valparaíso who worked in the diverse music industries and followed aims of fraternity and mutual assistantship. I would like to thank SLAS for awarding me this grant; my supervisors, Eva Moreda Rodríguez, John Williamson, and Martin Cloonan for encouraged me in this project; and, above all, Pia Settimi for her trust, warm hospitality and friendship.